Google signed Goggles’ death warrant the moment it launched Lens, and now it looks like the tech giant is ready to bid farewell to its old image recognition app. As Android Police has noticed, the only thing you’ll see when you fire up the Goggles app is a note that says it’s going away. If you have a phone that’s compatible with the standalone Google Lens app, the note will come with a button that leads straight to Lens’ download page. 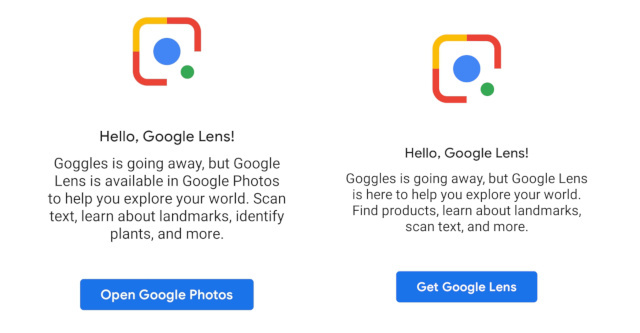 But if your phone isn’t, then the memo mentions that Lens’ features are available in Google Photos, and the download button is replaced with one that opens the Photos application. Like Google Lens, Goggles allowed you to look up real-world objects on the internet using the phone’s camera. You can think of it as an early iteration of Lens, which is much smarter, better at recognizing objects and has more features. If you still have the old Goggles app, go ahead and launch it for the last time before deleting it from your device.